DENVER, Colo. (September 18, 2015) - Denver voters are being asked in the November 3, 2015 election to approve more than $700 million to expand the Colorado Convention Center and to build a new National Western Center, a year-round events, equestrian and educational facility that will also be home to the National Western Stock Show. Funding would come by extending current taxes that are set to expire in 2023. No new taxes will be involved. An independent study by the Strategic Advisory Group (SAG) released in 2014 recommended the changes to the Colorado Convention Center as well as advising that new facilities be built for the National Western. A master plan for the Colorado Convention Center is in development. The development of new flexible meeting and ballroom space of up to 85,000 sq. ft.; the addition of 120,000 sq. ft. of new pre-function and service space that will also include a 50,000 sq. ft. outdoor terrace to be located on the roof of the existing convention center. Both the pre-function and outdoor event spaces will have spectacular, unobstructed views of the Rocky Mountains and city skyline, allowing event attendees to take advantage of Denver&apos;s 300 days of sunshine. These new facilities will be seamlessly integrated into the building, and attendees will have easy access to the center&apos;s existing exhibit, meeting room and ballroom levels. Denver voters are also being asked to approve funds for a new National Western Center, home to Denver&apos;s famous National Western Stock Show, that will be a state-of-the-art, year-round events, equestrian and educational facility, as well as an agricultural research center in collaboration with Colorado State University. This new development will include a new transit center and also transform more than one mile of the adjacent South Platte River, creating a new park and outdoor event space. 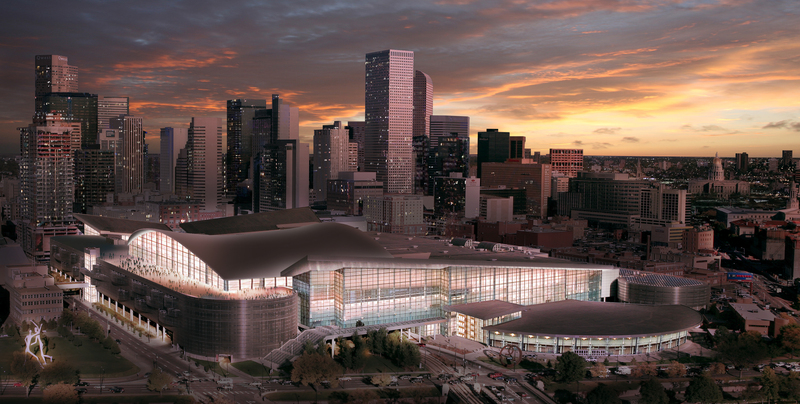 Denver then hired MIG and Fentress Architects, the original architects of the Center and expansion, who are now working on a master plan for the Colorado Convention Center and who have produced preliminary renderings of the expansion&apos;s major features. The Colorado Convention Center celebrated its 25th anniversary in June 2015. It is credited with generating more than $500 million in annual economic impact for a total of more than $4.8 billion since the center was expanded in 2004. The center has also been the catalyst for many improvements downtown. Denver now has nearly 2,200 hotel rooms within one block of the convention center, more than 8,600 hotel rooms within walking distance and will have more than 10,000 downtown rooms total by the end of 2016. "We are very pleased with the preliminary designs, which are directly in line with the findings of the SAG study. They really capture the Rocky Mountain spirit and take advantage of Denver&apos;s fantastic views and year-round mild weather," said Richard Scharf, president & CEO of VISIT DENVER, The Convention & Visitors Bureau. Scharf said there is no timeline yet for completion of the expansion. He said that because the expansion will be located on the roof of the existing Colorado Convention Center, it should have very little impact on other business in the building. "We&apos;re very fortunate that in 1999, the architects and the City had the foresight to reinforce the roof during the expansion of the center to allow for vertical growth," said Rachel Benedick, Vice President of Sales and Services at VISIT DENVER.